The Brown Eyed Girl Kemper Profile Pack captures the sound of the 3 channel “brown eyed” British flavored amp. Channel 1 is lush Marshall-esque cleans reminiscent of Hendrix. Channel 2 is classic Marshall crunch to hard rock gain that covers just about anything and channel 3 redefines the level of clarity possible with high gain amps. 63 incredible profiles, 25 direct and 38 studio. 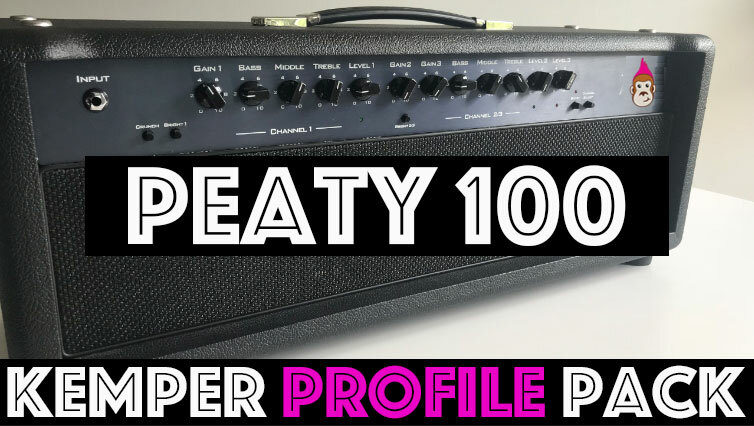 The Peaty 100 Kemper Profile pack combines smooth yet brilliant highs and a smoky midrange just like the world's best Peated Scotches, as the name implies! This Profile Pack contains the very best in Plexi and British clean tones we have ever encountered in an amplifier. 74 profiles (35 studio and 39 direct). This is the quintessential Plexi clean, mean and scream Pack! 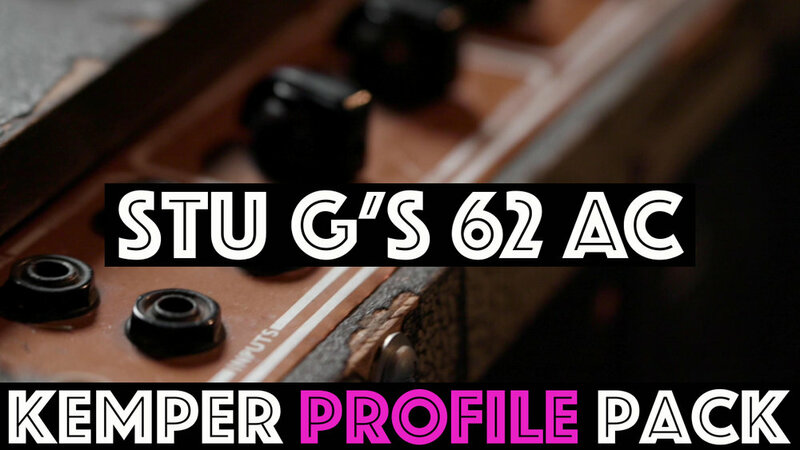 The “Stu G 62 AC30 Kemper Profile Pack” seeks to capture the sound of maybe the best sounding amp I have personally encountered. This 62 pre top boost original AC with two original blues is the tone I have been chasing in my head. There are lots of great amps out there with lots of great tones. Everyone has different tastes, but in my humble opinion…These are the best profiles we have ever made! The Too Stone Krystal is full of Rich, Lush, Full-bodied, Cleans. This American voiced amp doesn’t really get “dirtier” but increasing the gain has huge effects on pick dynamics, transients compressions and over all feel. 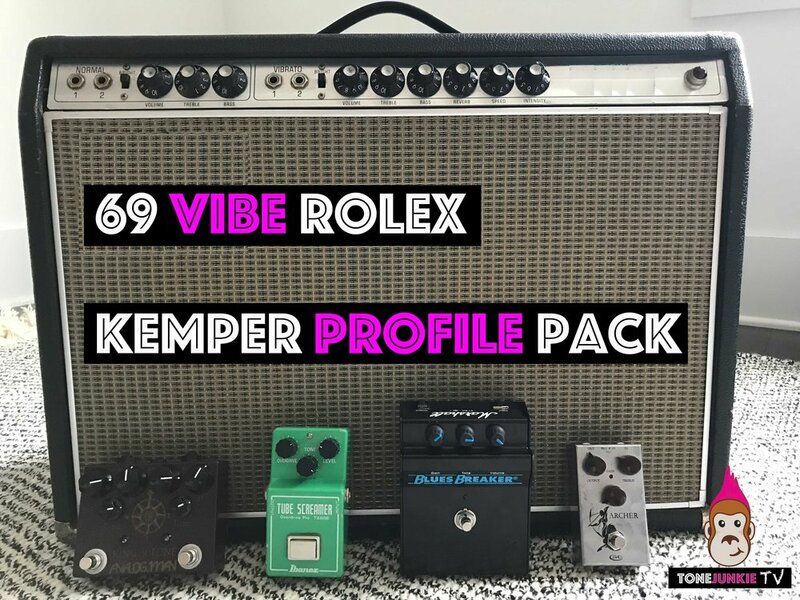 The Spacey Tone Kemper Profile Pack seeks to capture the unique sound of a single ended 5w 6v6 amp that sounds capable of low wattage American Cleans to classic tweed growl, but with an added punch and fidelity. We profiles this circuit on 3 EQ settings, Low cut, Normal and Fat…. The Alnico Gold Kemper Cab Pack features 10 close mic’d captures of a 2x12 Alnico Gold and they pair perfectly with Tone Junkie Direct and Studio profiles. The Scum M75 Kemper Cab Pack features 10 close mic’d captures of a 2x12 Scumback M75 Cabinet and they pair perfectly with Tone Junkie Direct and Studio profiles. 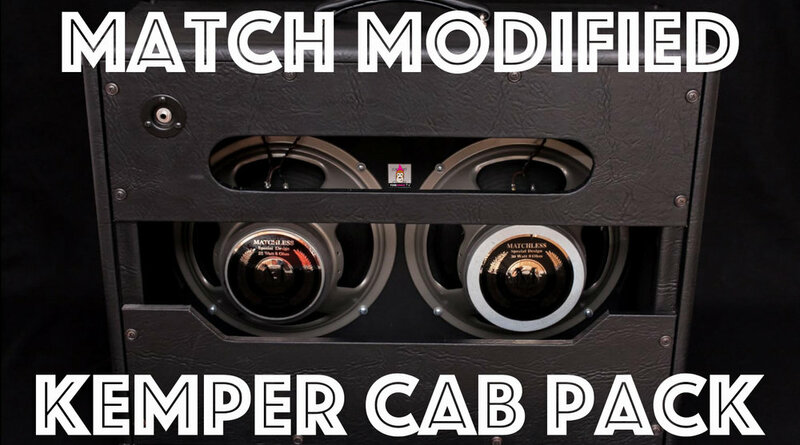 The Match Modified Kemper Cab Pack features 20 close mic’d captures of a 2x12 Matchless Cabinet with Matchless Modified “H30” and “M25” speaker made by Celestion. They pair perfectly with Tone Junkie Direct and Studio profiles. 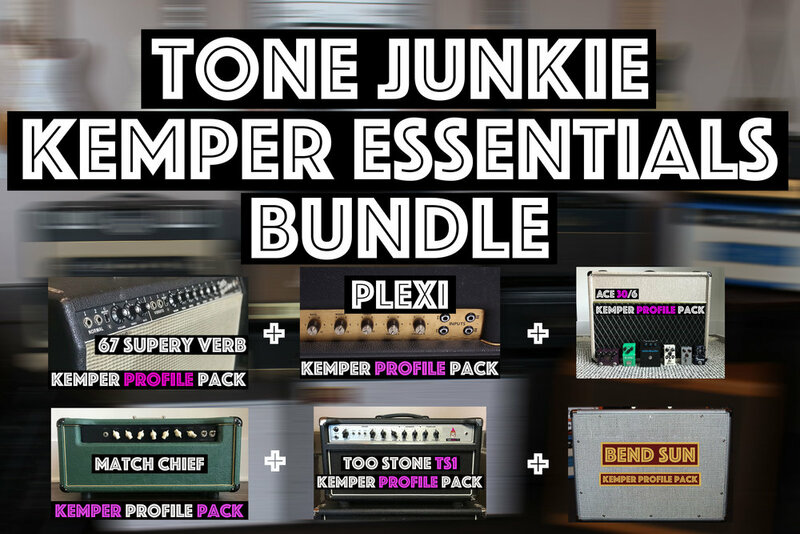 The Entire Tone Junkie Kemper Profile Collection available for one low price. The Everything Pack includes every single pack you for sale on the Tone Junkie site. 1600+ profiles that cover American Blackface and Tweed cleans, British Top Boost, Normal EF86 style chime, Plexiglass grind and tons of boutique edge of break up tones. The Saving in this Pack are incredible, you are saving well over 50% by bundling all these packs together! The Sooze TS19 Kemper Pack captured the tone of an amp made specifically for our very own “Sooze”. It is a unique combination of a Black Face Deluxe preamp section going into a Tweed style 6l6 power amp. This gives the Sooze’s TS19 Kemper Profiles clean BF style headroom at cleaner settings but full punchy breakup at higher settings as the 6L6’s break up. 3 speaker choices, 22 studio profiles and the Sooze’s TS19 go to performance. The 87 Silver Jub Pack seeks to capture the tone of the late 80’s classic amplifier adorned with it’s iconic silver tolex. These are modern classics and have appeared on countless rock records from GNR, Joe B. and Chilli Peppers. This pack is a Rock Masterpiece!!! We’ve captured 29 Studio profiles along with 14 direct profiles…. The Stu G’s Park Kemper Profile Pack seeks to captures the sound of the original 1976 Park 212 Reverb used by Stu G on tons of recordings with Delirious and countless recording projects. This pack contains profiles of channel 1, channel 2 and the channels linked together. We’ve also included Dual Profiles of the 76 Park and a 73 JMP 50…WOW!!! The Tweed Twin captures the tone of the 40 Watt 2x6L6 powered “Low” powered Tweed Twin. From warm full cleans or punchy brightness from the Normal and Bright channels all the way up to roaring tweedy mids. 37 beautifully captured studio and direct profiles! NOW ON SALE FOR 10$!!!!!!!! HW’s Favorite Pack!!! The ACE 30/6 Pack from Tone Junkie feature 73 of the most amp like profiles ever captured for the Kemper. We've profiled this 6 input UK made VOX on the Normal Channel, Brilliant Channel and both channels combined first with Greenbacks then with Blues. From clean to scream and everything in between, on it's own and pushed by some of our favorite drive pedals. If a vox can make the sound, we have it in this pack! NOW ON SALE FOR $10!!! The Card Scrambler captures the sound of the zero feedback, Class A, 6L6, boutique favorite. This amp is a boutique take on the classic "deluxe tone" delivering rich 3d swirling clean tones with top end clarity but running in Class A. 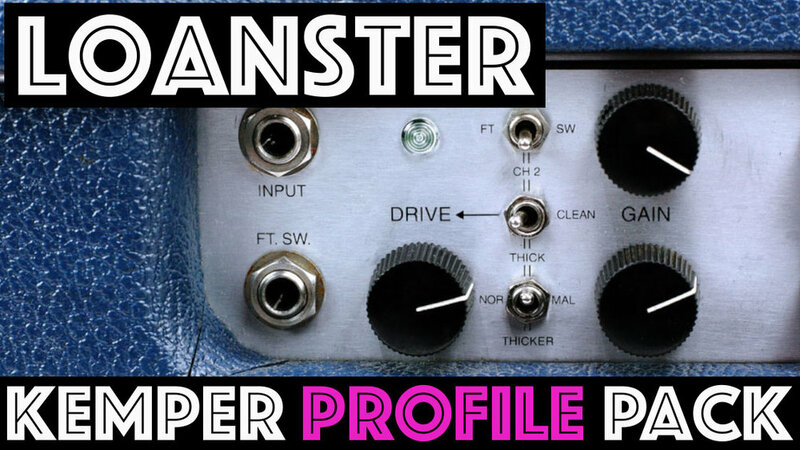 This Profile Pack features 21 beautifully captured profiles. If you are looking for those beautifully full bodied Fender Tweed cleans or that low midrange growl of a roaring 4x10 tweed amp…Look no further! The 4x10 cabinet keeps the lows tight even with a plethora of low mid range giving these profiles their characteristic harmonically rich girth…. 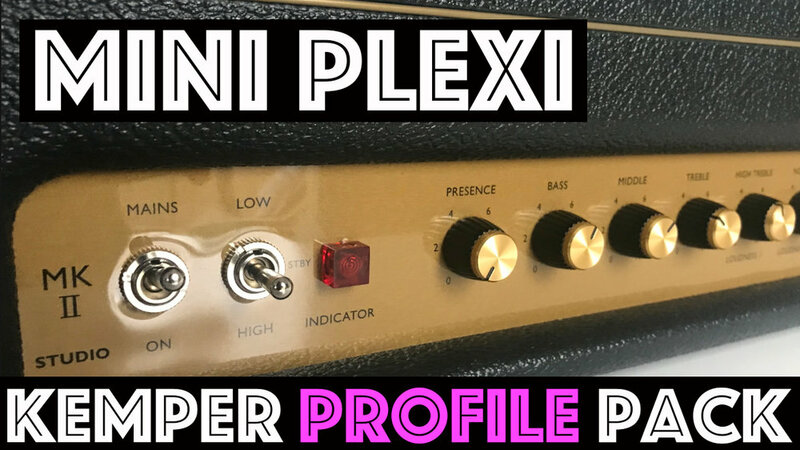 The Plexi SL Kemper Profile Pack from Tone Junkie captures the classic sound of a hand wired M******* Plexi! We’ve covered all the classic tones from Jimi, Jimmy, Ace, Eric, Angus and everyone else!! Plug in a strat and you are going instantly remember the sounds of the 60’s and 70’s rock pioneers…. Get ready for one of our most musical packs yet! This one is special!!! Owned and used by the man himself. Played live with the Trio and seen on several TV appearances before the production models came out. We have captured 21 studio profiles including John’s settings marked on the amp! This is that tone! Percussive and strong yet beautiful and articulate with a deep bass. 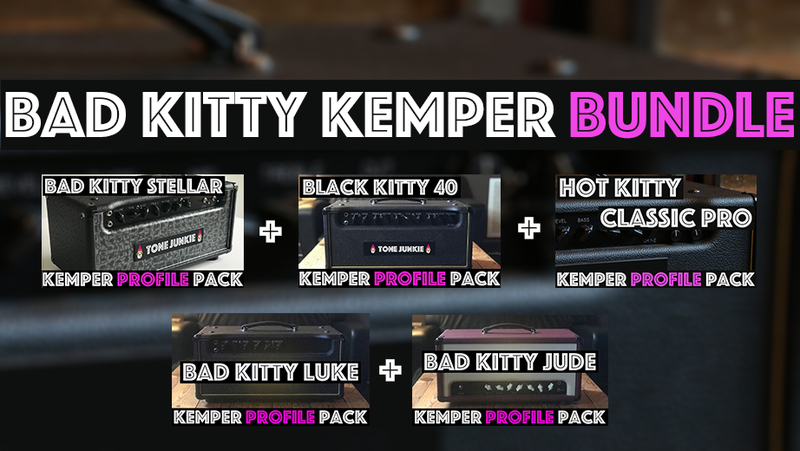 The JM Kemper Bundle contains both the JM Proto 1 Kemper Profile Pack and the JM Overdrive 100 Kemper Profile Pack. Two signature circuits beautifully captured by the Tone Junkies across a total of 47 studio profiles and available as a bundle an sizable discount compared to purchasing both packs on their own. Hot Kitty Classic Pro Profile Pack! NOW ON SALE FOR $10!!!! The Ellie Pine Kemper Profile Pack captures the very best in boutique 5e3 tones! We’ve included profiles of the Normal Channel (N), Bright Channel (B), and both channels Jumpered (J). The Bright channel is snappy and crisp. The normal channel is fat and warm. The (J) profiles have snap + a full midrange and a little more gain, making the jumper profiles perfect for rock! The Tone Queen Falcor Kemper Profile Pack is a pack we are truly proud of! Between the Rhythm, Tweed and Lead voicing that this little single channel amp may be more versatile than many three channel amps! Rhythm is a punchy American tone, Tweed is more midrangey and dirty, and Lead is straight up sustain with tons of pick sensitivity…. The Bad Kitty Stellar Kemper profile pack captures the tones of the EF86/EL34 signature amp of “The Duke of Tone!” In a nutshell, this is the P&W rock amp! It’s as if Rock n Roll put on it’s Sunday best! The EF86 allows for enough clean headroom on “T” profiles to get sparkling bright cleans but overall, the EF86 provides a midrange crunch with a boutique million dollar high end that makes for amazing pushed midrangey crunch tones but with a super refined chimey top end. 43 beautifully captured profiles using our favorite Scumback M75 (Creamback) and Celestion Blues plus 5 direct profiles. The Black Kitty 40 Kemper profile pack captures the tone of the classic boutique pairing of a 12ax7 and EF86 preamp but instead of EL84s, the Black Kitty 40 uses EL34 to increase headroom and bass response. We paired this pack with a modified V30 making it quite a bit different than similar circuits “Match” or “Kitty” packs we have released in the past. You will immediately notice a “honkiness” even on cleaner profiles. The V30 speaker provide the perfect mid focus to push you thru the mix. On it’s own you may perceive it as midrange but in the mix you hear a focused guitar tone that stays audible even in dense mixes. 18 Studio Profiles. Dual Pack #3 features our best line up of dual profiles yet! We’ve put together some classic pairing as well of some dual amp set ups you hear on popular records. 36 unique sounding studio profiles. Dual Pack 3 consists these profile sets, “Englishmen”, “Bad Kitty Twin”, “Bad Kitty AC”, “Super AC” and “AC Super”. The Bend Sun Kemper Profile Bundle contains both the “Bend Sun Kemper Profile Pack” and " the “Bend Sun 2 Kemper Profile Pack.” 80+ studio profiles and 12 studio profiles and it’s ON SALE!!! The Edge Tweed Pack seeks to capture the sound of the classic Tweed deluxe 5e3 circuit with a Celestion Blue. This pack is full of tweed cleans, tons of edge of breakup tones, full on overdrive and all with the signature tweed low midrange. That low midrange push means Strats and Teles sound full and fat, while HB guitars push this thing into heavy blues! The Bad Kitty Luke Pack seeks to capture the sound of an amp that is best described as the biggest AC30 you’ve ever heard. Upgrading from EL84s to EL34s give these profiles a more open and less compressed feel while still maintaining a familiar British sound. Channel one gives you a plethora of sounds with varying levels of midrange and brightness and can take your guitar from more clean and bright to thick and wooly. While Channel two feels most like a AC30 on steroids and can provide high powered british cleans to all out raging break up while staying more controlled and tighter in the bass than a vintage circuit would. The Bad Kitty Jude Pack seeks to capture the sound of unique that combines two boutique british inspires preamp channels with a 6v6 power section. Channel 1 uses a 12ax7 to get chime and a bit more headroom while channel two uses an EF86 and a rotary tone switch for more break up and midrange. Most commonly an amp like this would be built with EL84s, but the 6V6 power tubes give this pack it’s signature high end sparkle reminiscent of driven vintage american style amps. From this pack you can expect a familiar Voxy style front end with a sparkle high end that has a unique snap! The Too Stone Bloom Kemper Profile Pack captures some rich high end boutique tones from a 6L6 Power section. This circuit feels like a Super meets a Dumble or like a tricked out CRS. The Too Stone Bloom stretches from high headroom boutique cleans to expensive sounding drive with the perfect amount of compression. Check out the demo! The DairyBoy Creme+ Kemper Profile Pack seeks to capture the tones of some of the most harmonically rich boutique American amps coming out of HW’s home town, of San Francisco, California. This Pack is 60 profiles (50 studio + 10 Direct) capturing two circuits using both 6V6 and 6L6 plus tones from both American and British Alnico speakers. This pack is one for the "favorites" list. The Double Agent Profile Pack from Tone Junkie captures of the sound of a "Dual" channel amp featuring tones from both sides of the pond. The AC side has several profile sets, (N) Normal, (B) Bright, (TB1) Top Boost 1, and (TB2) Top Boost 2. The American side of the amp features classic California cleans. Mix them together and you get the dual amp tones that are sure to become a new Tone Junkie Favorite. 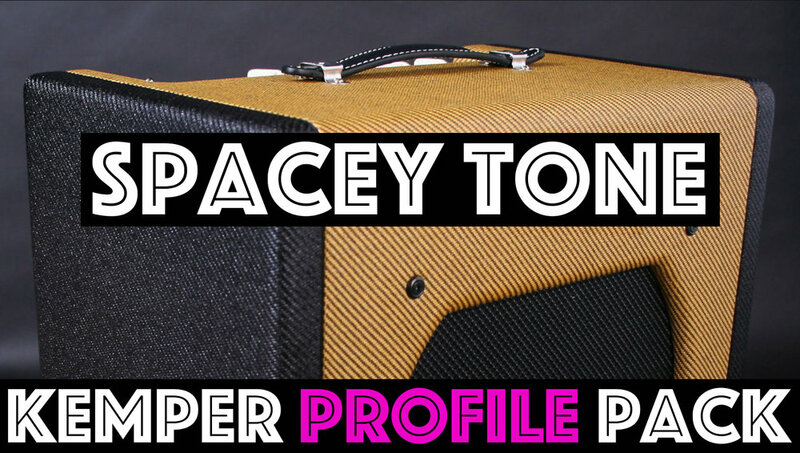 The Tone Junkie “Super” Kemper Profile Pack seeks to capture the other “American” amp sound. 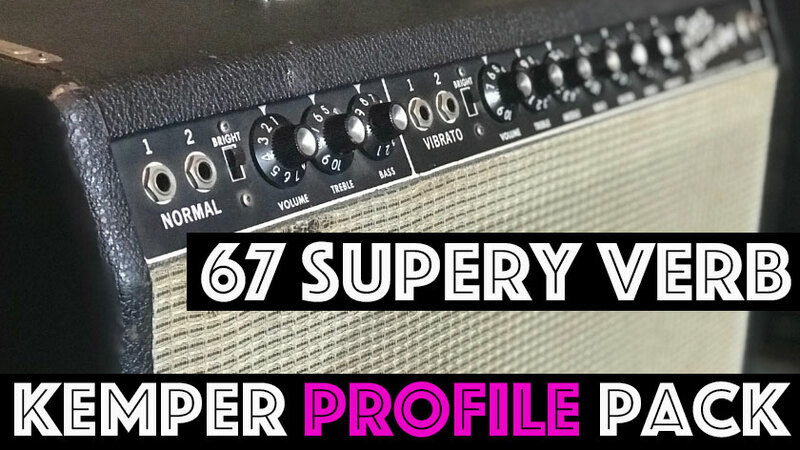 We’ve captured 55 profiles across 4 profile sets including the “Super 1600”, “Super Comet”, “Super Thunder” and “Super States” (Comet + Thunder). These profiles are categorized by their “American” tonal quality but with a heftier low end, an “on the edge” quality, and tons of note bloom! The ACE15 Kemper Profile Pack captures the sound of the iconic hardwired 15 watt amp we all love. We’ve extensively captured all the tones in this amp across 44 profiles. We’ve profiled it on all channels, Normal, Normal w/ Bright switch, Bright channel, Jumpered the channels, profiled it all thru greenbacks and then again thru blues! Want to look like HW? Now you can!!! Check out all the swag available on the swag page! T-shirts, Hats, and the HW Signature Floral Flatbill Hat!!! Tell the world you are not only a Kemper player but one with discerning ears who plays some of the best profiles around! This weekend we are doing something a bit different! Take whatever you would have spent on this pack and pay it forward! Go support a profiler you haven't tried out yet or a pack you have been eyeballing. Happy Labor Day Weekend! 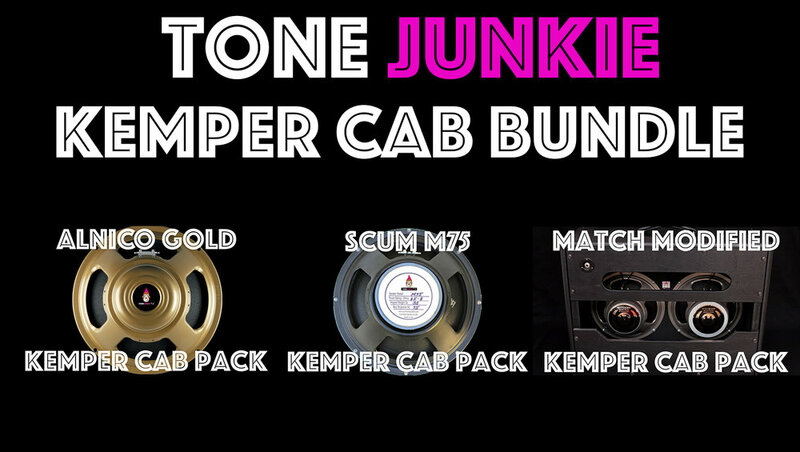 The Tone Junkie DZ Kemper Profile Pack seeks to capture the sound of 3 amps from “Medical Professional” Z! ;) We all love the official pack from the good people over at the “Doctor’s office” but these are Tone Junkies take on some of our favorites. The Tone Junkie DZ pack contains 40 beautifully captured profiles and 3 profile sets including, the “DZ M18”, “DZ Carmen G” and the “DZ Road 66”. The Twinery Verb Kemper Profile Pack from Tone Junkie faithfully captures the tones of the iconic 100W 2x12 American clean machine from about 1 million popular recordings. These are the Flagship sounds that put that little shop in Fullerton, Ca on the map as an amp maker back in the 60's and it's part of the Tone Junkie Free Pack! The Super Dark Magik pack is 21 profiles of this amazing little circuit. Channel one is bright and percussive. Channel 2 is full and deep. Jumping these two channels together is where the magic happens. The phase interior is slammed by both channels breaking in the fashion of an old british plexiglass amp but with a more american voice. This is a really unique profile set with everything from chimer top end, to darker breakup to vintage old school crunch with tons of mojo. This is a special one! The Bend Sun 2 pack is the follow up to one of the most beloved profile packs we have ever released, the Bend Sun Kemper Profile Pack! The original pack boasting the classic “Butterfly” and “Chimer” profiles, has become a classic in the Kemper community. The Bend Sun 2 pack features 50+ studio profiles and 12 direct profiles of the new “Ear Hard” and “My Cousin” profile sets! The Match Club captures the sound of a particular single EF86, two 12ax7 EL34 powered amp we all love! If you loved the Match Chief you are going to like this one, a lot! This pack features 3 speaker accompaniments courtesy of the mismatched cabinet with two separate speakers. Profiles marked "H" feature the H30 speaker, profiles marked "M" feature the M25 greenback and profiles marked "HM" use both speakers mixed together. The Match C30 Profile Pack from Tone Junkie capture the sound of a modern boutique classic. Offering profiles from both the 12ax7 and EF86 side. The Match C30 pack delivers all the refined top end and signature chime from these never matched amps along with a more mid range rock tone from the EF86 side. 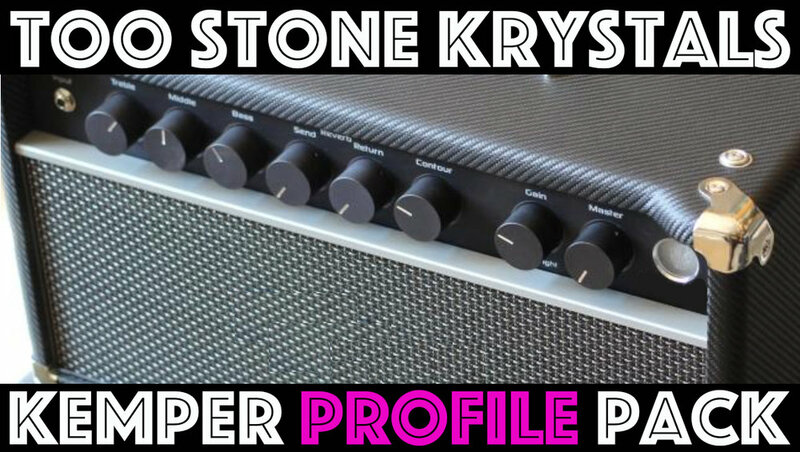 46 Profiles in a Pack that is sure to become a Tone Junkie classic! 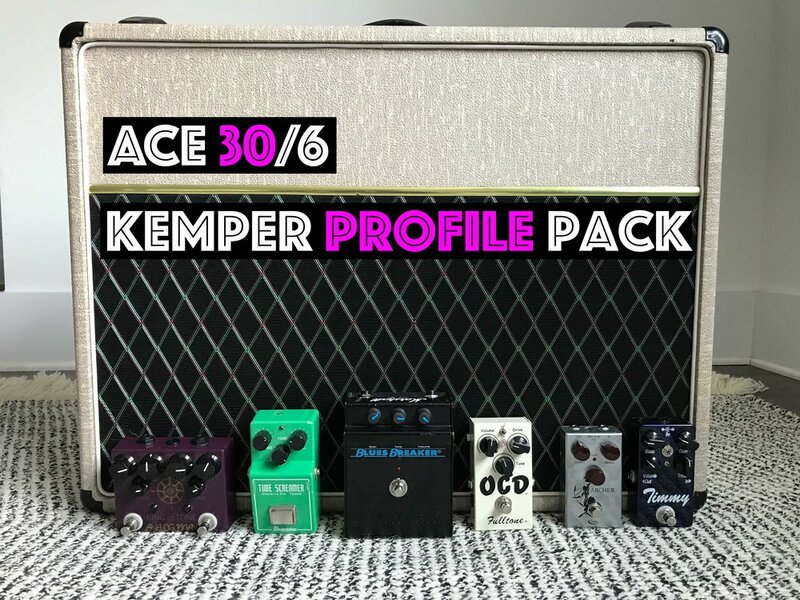 The Match 30/15 Kemper Profile Pack captures all the sounds from an early Tone Junkie favorite and gives you everything in between. We previously released 3 profiles of this pack in our "Profile Pack #1" but after numerous requests we decided to give you everything this boutique monster has to offer. The Match 30/15 combines a Lighting front end with a modified tone stack and a beefed up output section. Combined with some of our favorite effects and 3 speaker configurations, there are profiles that will work with any guitar or pick up combination. The 69 Vibe Rolex Pack from Tone Junkie seeks to capture the sound of an all original 69 F***** V**rolux amp. With all original tunes, pots and speakers this 2x10 vintage amplifier has that classic american clean sound but with a deep yet tight bass response and smoother highs than many of its 1x12 and 2x12 cousins. Producers now how wonderfully these record and how well they pair in a mix with similar amps using 12 inch speakers. The Dual Amp #2 Pack from Tone Junkie captures the sound of some of the most iconic amp pairings heard on Sunday Mornings and Friday nights. If you have every wished the ACE 30 pack has a bit more oomph in the low end check out the AC30 Beauty profile set. If you are looking for American and British high end competing for your attention check out the ACE30 Rolex set. And of course how about the signature amp pairings and signature settings from some of the P&W Elite. Check out the "Pope" and "Hills Sig" profiles in the Ace Sonic and Hills profile sets respectively. 45 profiles, including boosts and ODs. The Official Tone Junkie Pack 2 features 55 profiles seeking to capture the sounds of some truly amazing amplifiers. Pack 2 offers beautiful full bodied American clean tones, tweed crunch, British chime, plexi grind and everything in between. The Official Tone Junkie Bend Sun Profile Pack seeks to capture the sounds of some of the best boutique amps coming out of Portland, Oregon. These amps are being heard around the country by artists like Ryan Adams, and the guitar tones of Bethel. Kemper users can now enjoy even more tonal bliss with these beautiful sounding clean, pushed, edge of breakup and overdriven amps captured in 32 profiles. The Dual Amp Kemper Profile Pack combines the sounds of some of our favorite amps. We've paired these amps together for their complimentary voices, giving you wide, full sounding profiles that feel like your plugged into two amps at once! Sign up for our email list and receive our free profile sampler pack. This pack currently feature 12 incredible profiles from Profile Pack #1, Pack #2 and the "Bend Sun" collections. 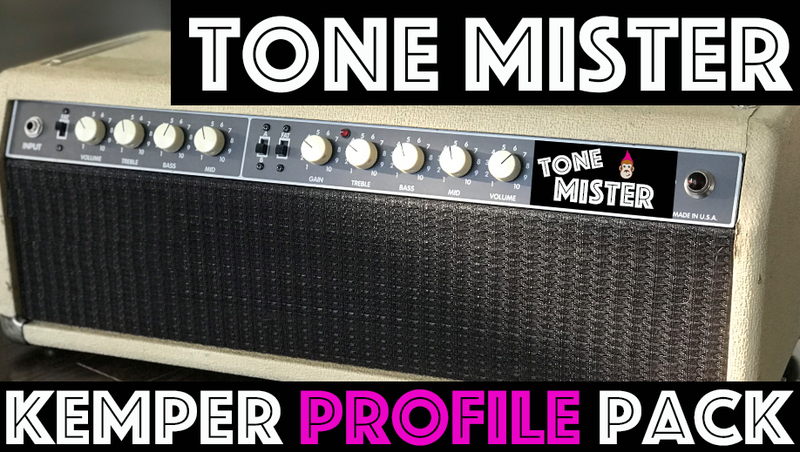 If your on the fence this is a great way to see what all the fuss is about and why Tone Junkie Profiles are being called some of the best around! "Match Lighting", "Bad Kitty Panther", "Nigel 30", "Tall Weeds Myth Dallas", "Immix Elevin", "Tangerine Rocker"